The Imaging Channel had the chance recently to meet with Dennis Amorosano, Vice President and General Manager Marketing and Professional Services, Canon USA, and discuss how the imaging channel is evolving. Together we contemplate speed, big bets, workflow and taming the dragon. Join me in the SpeakEasy. How did you and your company get to where you are today? Canon has been selling various types of products in the U.S. since the mid-1950s and as a result has worked with many different channel partners, but it probably wasn’t until the late 1960s and early 1970s when we started to enter the marketplace with what you would consider office equipment technology. One of Canon’s directions at the time was to build out a channel of distribution that would help Canon reach the end market. That’s where it all started. Things have changed dramatically since then. When I joined Canon, Canon was just beginning the process of bringing our first digital multifunction technology to market, so I had the opportunity to start with a technology that was completely foreign to what most copier dealers had experienced. I was in the computer industry prior to coming to Canon. This allowed me to take my skillset and get in on the ground floor with Canon at a time when IT technologies and networking were unknown concepts for the vast majority of the copier industry, and even internally for the most part. It has been really amazing to see what has taken place over the 20 years that I’ve been involved in this channel. Being a trailblazer does not come without challenges. It was interesting. We brought a digital copier to market that was based on a set of technology capabilities that very few people in the channel were familiar with. It came at a price point that was 30 to 40 percent higher than most analog copiers, which made it virtually impossible to sell. But we had a vision that the marketplace was going to make a transition, and as other vendors entered the space, it brought validation to Canon. As that happened, the marketplace started to adopt and over time the business gradually started to shift. Since then, our company and certainly others in the industry have layered software and services on top of the traditional hardware platforms, so the types of solutions we are bringing customers today are wildly different than what we were offering 20 years ago. In the beginning, we were fortunate just to be able to have customers connect the devices to networks and use them for printing purposes. Today, I don’t know of many customers, if any, who are simply buying digital copying technology. It does also show you how those big bets can pay off — perhaps only visible in retrospect. It was challenging, but Canon is a company that makes long-term investments. While there were certainly times that it was discouraging, you would also have many scenarios that would play out that really gave you hope and served as an indicator that the market would shift over time. As we moved into the late 90s and the early part of the millennium, the business really took off in a meteoric way, so all the work and effort that went into being first to market and breaking new boundaries paid off handsomely for Canon and helped set the stage for us in terms of the market presence we hold today. It also helped to pave the way for the investments we were able to make in software and services delivery that are a key part of our delivery portfolio. We can be proud of our path. We were trying to do something that was very new and unique and, as it turned out, we were successful, so it was a great time. What are some of the strengths and weaknesses you see in this channel? The channel has been so resilient, and able to make the transition into delivery of net new types of products and technologies and also adjust business models. That isn’t easy, and in fact even today it is still very challenging, but the channel has had a way of adapting. This has served the channel well, so even while the industry as a whole now is in some ways slowing down and the overall markets are certainly not high-growth markets, we still have many channel partners experiencing double-digit growth on a year-over-year basis. I think that is a testament to the fact that they have been able to make these transitions in their business models. But while the channel has certainly proven to be resilient and adaptable, there is still too much reliance upon legacy business models as opposed to the types of business models that are most conducive for selling software and services. The channel is getting better at this, but I do not know that it is moving fast enough. We still have many situations where our channel partners are dependent on their traditional legacy hardware delivery business models and are struggling to make the transition to a hybrid model that is highly inclusive of software and services. Some of those partners may find it challenging to remain viable in their local markets, given where customer demand is headed. I would have liked to have seen that move made quicker than what we are currently experiencing. Do you think part of the reason the dealers are not adjusting their models quickly enough is simply because they have been so successful at that traditional legacy model? In some ways, I do. I think there are many factors and that is one of them — success in some respects can breed complacency. I also think the business models are very different. When you look at a traditional copier dealer business model and you compare that to what you would see from an IT VAR, they’re so different. Selling cycles are different, compensation structures are different, skillsets you need in the organization are different — I think that’s really been one of the biggest inhibitors to a speedier transition. The other thing that for me is a concern is that you typically see a fair amount of turnover in sales personnel, and the amount of training investment that’s been required for sales personnel in the past is not all that significant. A new salesperson is expected to start to deliver some level of productivity within 30 to 60 days. That just doesn’t work in a model that is more software and services oriented. In fact, many of the selling cycles in that model can be six, 12 or 18 months. Most of our channel hasn’t yet made this transition to looking at training differently; there is still a lot of hesitation to making the needed types of investment in sales training. I spent the first eight months of my career at NCR in sales training. I don’t think our channel partners need to make that level of commitment, but certainly they need to make a bigger commitment than what they make today and that’s going to remain true going forward. The business model is not going to get any less complex than it is now. What single piece of Canon technology do you feel has had the biggest impact on the evolution of the channel? This is a tough question because there are so many technology innovations that we’ve brought to market just since I’ve been with the company. Certainly the network-connected MFP has to rank as one of them because in some ways that was the impetus to drive the channel to take a different approach to the customer. It was also the catalyst for the channel to start to make investments in different types of personnel that had different skills. The imageRUNNER products were the bellwether for the channel. We also introduced eCopy document capture and distribution technology back in 1996 — we were driving software solutions in the market at a time when most manufacturers were just happy if they were successful in selling a digital copier. eCopy became the de facto standard in the industry for that type of function. That had a profound effect on the speed with which our channel started to make the transition to becoming more solutions-savvy. What was the most overhyped trend you’ve seen not live up to expectations? I like this one! There’s a lot going on in the marketplace right now that’s hyped — there is a lot of hype around 3D printing. I actually don’t think it is overhyped — I do think there’s going to be a significant market opportunity there, I just don’t think it is right around the corner. I think it is going to take some time. But if I had to look at something that I would say is overhyped, I would say managed print services. Our perspective at Canon for managed print services is probably different than a lot of vendors in the marketplace because most managed print services deals are ultimately going to take an action that may in fact diminish the number of laser printers in their organization and in doing this, it is very likely that it will be an HP printer that is eliminated, since HP has a dominant position. If we look at this from a Canon Group perspective, that is not a good outcome because of our partnership with HP. I’m not sure who originally came up with the managed print services idea in the industry, but they didn’t do the industry any favors. It’s an exercise in diminishing returns and I don’t think managed print is good for anyone in the industry on a long-term basis. Unfortunately, it has reached a point as a manufacturer where you almost have no choice but to be engaged, because the opportunity cost of not being engaged is so high. I also think it is overhyped because it holds out expectations that customers can drive continual savings and I don’t think that’s realistic — at least not in terms of print itself. 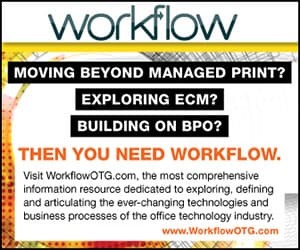 I do think most customers gain benefits from implementing a managed print services strategy, but those benefits in terms of cost savings dissipate after they’ve gone through the process of “right-sizing.” Then the question becomes, does the customer extend beyond managed print and move into workflow and other areas as a way to continue to extract value from those relationships? Is there a better term to describe this evolution of the information lifecycle? At Canon we talk to this as “managed document services.” Where the marketplace is today and where it is headed is well beyond just managing print. If you only look to manage a customer’s print environment, you may find some savings there for them if they are in an environment that hasn’t been managed to date, but the real value is when you start to look deep into office and application workflow. That is where you can really have a material effect on the way their business operates and that’s where we think, as a manufacturer, there’s much greater value. People are starting to use managed print and managed document services interchangeably. Managed print services several years ago literally just meant “print,” but now people have a broader interpretation. Canon has been wary about just saying print because we have always wanted to do something broader than that. I wish I knew the answer to this question! There are so many things that are happening in the marketplace today that it is hard to predict what next big thing is going to take off. We already talked about 3D printing. Large-format technology and production printing have significant upside growth opportunities, although I don’t know that they are net new. They are traditional technologies that we’ve had in our product portfolio. What interests me right now surrounds what happens around big data, big data analytics, cognitive-type software technology that has learning capabilities, deeper levels of personalized interaction between users and technology, and changes in the way in which we as humans interface with the technology. All of these are coming and it’s a just a question of how quickly. What impact will these technologies have on the way that our technology is shaped in the future and how will we have to work with our channel partners to develop the skills needed to consult, sell and support those changes? That to me is really the next big question for the industry as a whole, and boy, I wish I knew the answer to it! Those themes are extremely complex. Sometimes technology can leapfrog, but in the office environment there is a very large dragon that needs to be tamed in the massive amounts of information that need to be archived, indexed, sorted, mined, and analyzed. It’s very interesting to me to see where it’s going to go. I think there are a lot of challenges within our industry and within our channel of distribution as we think about the speed with which some of this might happen. It will be interesting to see if the channel can continue to adapt and if we can maintain that same level of resiliency and be able to take on some of the new and different types of technology and the consulting services that we are going to need to provide along with it. There’s no shortage of intrigue there in terms of what’s going to happen, that’s for sure. Where does the channel need to evolve to be successful in the future? We need the channel to start to think about making different kinds of investments and accelerating their business model transitions so that they are more prepared and more equipped to take on these new areas as they emerge. If we can do this as a channel, it certainly puts Canon in a position where we can be more successful. It is much healthier for us as a company to have a good combination of direct-to-customer capabilities and strong channel partners. And we do have this today — we are very fortunate. We have a very strong direct operation in Canon Solutions America and we have the finest dealer channel in the marketplace, so having that same mix long-term is a great benefit to us. Hopefully we’ll see our channel partners continue to drive this evolution and maybe even pick up the pace. This article originally appeared in the June 2015 issue of The Imaging Channel. Channel Convergence: Roadblock or Opportunity?